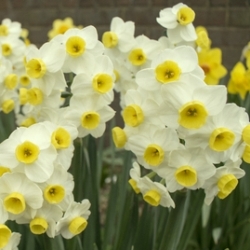 The Tazetta Daffodils perennialize well and, along with the Jonquillas, are well adapted to the Deep South. They are a vigorous, multi-flowering strain with several stems per bulb and excellent for indoor forcing. They may be small, but can make a dramatic statement in the garden. 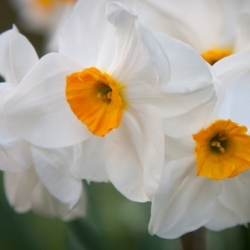 Tazetta Narcissi are a bit tender and require winter protection farther north. Ideal for borders and rock gardens. Our Miniature Daffodil Collection contains 20 each of Minnow, Baby Moon and Tete a Tete, individually packaged and labeled. One of the cutest flowers in your garden! 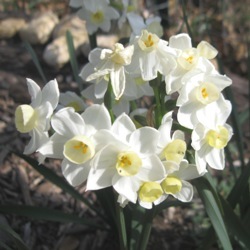 Canaliculatus Narcissus is a little tazetta-type daffodil, each stem producing clusters of 3 to 12 sweetly fragrant flowers with pointed cream colored petals and golden cups. It forces like a Paperwhite and performs in the garden best in zones 6-10. Geranium Narcissus has a white petal and an orange cup. Each stem produces 3 to 5 wonderfully sweet smelling flowers. One of the last blooming daffodils. Great for mass plantings, containers and borders. Grand Soleil d’Or Tazetta Daffodils have 10 to 20 bright-yellow blooms framing orange cups. They're popular for forcing indoors, as they have a delicate fruity fragrance, but they require a couple of weeks longer if you decide to try to force them. Can be grown outdoors in the South. Clusters of many extremely fragrant flowers. 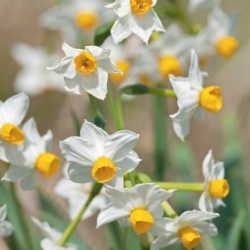 Minnow Narcissi have miniature bright yellow cups with pale yellow petals and 4 or 5 clustered flowers per stem. One of the smallest daffodils, a diminutive 8 to 10 in., its blossoms are the size of a quarter or smaller. These plants are ideal for borders and rock gardens. Scilly White Tazetta Daffodils have white flowers with short pale yellow cups, usually three to twenty flowers to a stout stem. It is sweet scented, but not as heavily as some. In the South Scilly White can be planted outside to bloom in early spring or late winter.